Review – The Great Heartland Hauling Co.
Home > 2012 > August > Review – The Great Heartland Hauling Co. The goal of The Great Heartland Hauling Co. is to score the most points by delivering goods to cities where they are in demand. 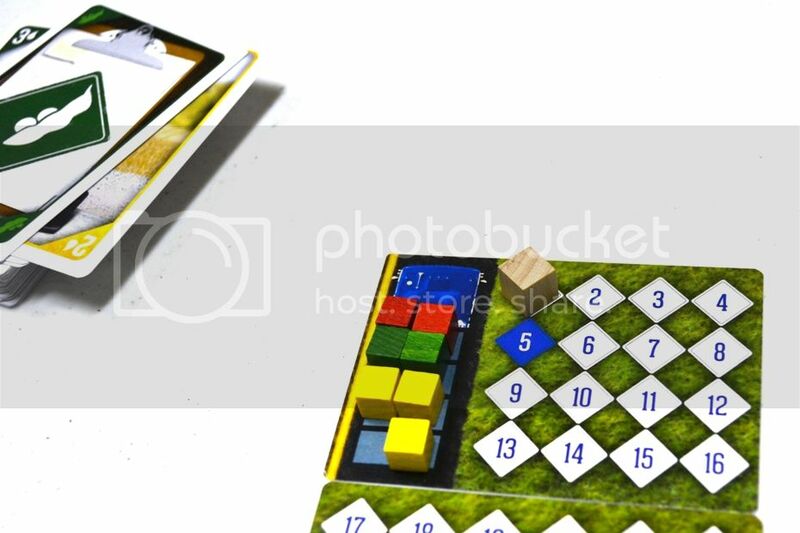 The “map” is actually a modular array of location cards that you lay out at the beginnig of the game, with each card having 5 cubes of its “native” good. Each card also then has two other goods listed which are in demand there, and which pay off for between 2 and 5 points when a cube of that kind is delivered. 1) Move – you must move between 1 and 3 locations every turn by either playing fuel cards from your hand or by spending points. You can’t double-back in the same turn, so every turn you have to move to a new card and do something there. • Load – You can discard goods cards from your hand to load matching goods cubes onto your truck from your current location. If it’s the native good for the location, you can load one good per card, but you can actually pick up other goods for two cards each. Only one type of good can be loaded on any one turn, though. • Unload – If goods on your truck are in demand at your current location, you can unload them by playing matching goods cards from your hand. 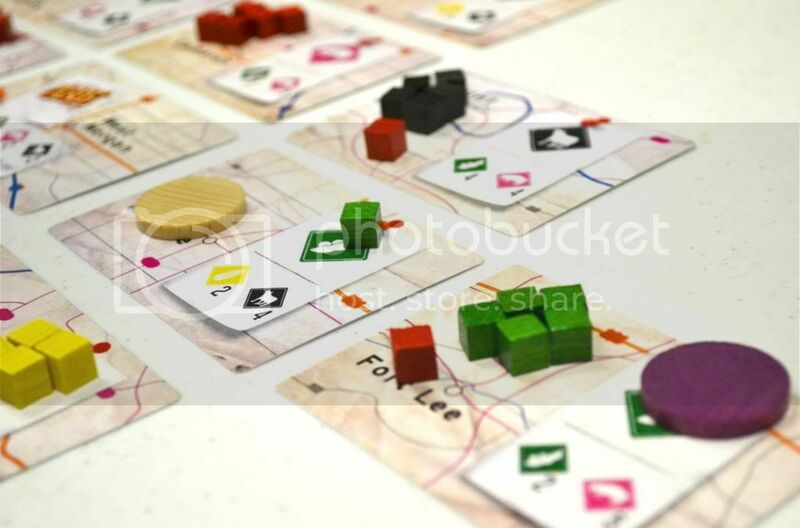 You then score points equal to the value of that good on the location card for each cube you unload. And again, you can only unload one type of good per turn. • Discard/Draw – if you either can’t perform either of the other actions or choose to do so, you can spend 1 point to discard as many cards from your hand as you want and then draw back up to 5. 3) Refuel – At the end of your turn, you always draw back up to 5 cards. You can either draw from the deck or from 3 available face-up cards (which are immediately replaced if you take them). And that’s really it. You play until one player reaches the target number of points (30 in a 4-player game, 40 in a 3-player game, or 50 in a 2-player game), after which everyone else gets just 1 more turn to catch up. The only final scoring is that you actually lose points for any goods cubes still on your truck (1 for veggies and 2 for animals). And, of course, the player with the most points after the final tally is the winner! The Great Heartland Hauling Co. is a truly excellent little game. It’s such a smart and elegant system, and I’m continually impressed with it the more I play. The core mechanic is probably the most elemental pick-and-deliver system that I’ve ever seen. You basically just spend cards to load up to 8 cubes on your truck, then you move around and spend more cards to unload them elsewhere for points. It’s so simple and quick to “pick up” (see what I did there? ), but it still seems to have a great bit of depth for how short it is. There are actually 4 different types (colors) of goods in the game: corn (yellow), soybeans (green), cattle (black), and pigs (pink). The vegetables score between 2 and 4 points when delivered, while the animals score between 3 and 5. But the simple balance here is that there are more of each vegetable card in the deck (15 vs. 8), and since you need cards both to load and unload cubes, it’s naturally a little more risky to invest in the animals (since you’re less likely to get the cards you need to deliver them). Again, it’s such an elegant little thing, but it works really well in practice! And something else that sort of took me by surprise at how much it impacts the game is the requirement that you have to move at the start of each turn. It would be easy to plan ahead if you could both drop off and load new goods at the same location. But since you always have to keep moving and because of the 5-card hand limit, planning is never quite that simple. It really becomes more of a juggling act between planning and being opportunistic as you keep on truckin’ from turn to turn. A couple of other factors also throw some monkey wrenches into the mix. First is the fact that you can’t ever move to a location where another truck already is. So, whether by chance or intention, it’s very possible that you may be blocked from the location where you really wanted to do some business. And since you can’t just sit around for a turn waiting to get back there, you often have to reroute yourself elsewhere and work on some secondary goal. The other thing is that each location can only hold a maximum of 8 cubes, regardless of type. So if I was planning on delivering 3 cubes of corn to Mount Berry for 4 points a piece, but someone else just dropped the 7th or 8th cube there, I’ve got to totally change my plan. Do I try to work around the three corn cards in my hand and get something else done as I buy time and move across the map to Troy where I can get at least 3 points for them, or do I go on and deliver them to Bedford Falls, which is really close, but where I’ll only score 2 points a piece? The game is chock-full of decisions like that, where you have to be flexible and resourceful, but rarely does it ever get to the point where you really feel completely frustrated or powerless. As I played a few more times, I also began to see the real power of the Discard/Draw action as well. It seems a little painful to pay a point to “do nothing” on your turn, but one of the keys to doing well is to churn through cards. Ideally, you want to be as efficient as you can, picking up or delivering multiple cubes at a time if possible, which will then also let you draw more new cards to then work on something else. But if you get stuck making single cube deliveries all over the map, you’re going to waste a lot of time and have very little options to refill your hand. So the option of a hand “reset”, especially when you see really useful stuff among the 3 face-up draw cards, is something that is a lot more powerful than you might realize at first. And while I’m talking about cards, then, let me get into the randomness in the game. Obviously, everything you do with goods requires you to have the appropriate cards, so there is a definite luck-of-the-draw element involved there. And it’s certainly possible that one player could have an easier time of things just because they drew better. But a couple of things keep this level of randomness from being any sort of issue for me. First of all, you can definitely mitigate the randomness by the choices you make. Loading lots of one good onto your truck may set you up for a big payout, but it also makes it a lot less likely that you’ll ever actually get them all delivered. So there is a natural balance there in how much risk you want to take on to yourself, both in which goods you collect (animals vs. veggies) and how many you take. Being diversified means that you’ll pretty much always have something to do, but that you’ll probably get less big payouts. So I almost always feel like the impact of luck on my game is appropriate to the decisions I make. The other thing is that the game still gives you a pretty decent amount of control over what you draw. You always have 3 face-up options to draw from, and even if you draw blindly, it’s then pretty likely that you’ll find a match for that card in the face-up ones. Still, though, there is always that possibility of making a perfectly reasonable decisions (like loading 2 cow cubes early on) that are foiled by bad card draws (when you then never see another cow card for the rest of the game). But mostly, I just find the randomness thoroughly appropriate for the depth and length of the game. I mean, come on, it’s a freaking 30-minute game! To keep it relatively light and less prone to over-analysis, you’ve got to have some random element there. And more than anything, that’s what makes The Great Heartland Hauling Co. really special; that it can fit such a cool experience into such a compact little timeframe. Since I sort of started off talking about theme in my introduction, let me finish off here by touching on it again. 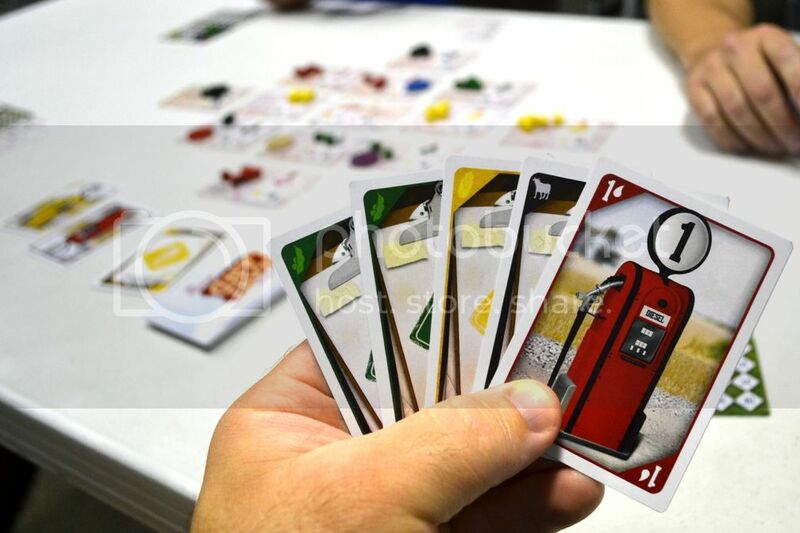 WIth such a simple, elemental game like The Great Heartland Hauling Co., the theme is, understandably, going to be pretty thin. However, even though I don’t necessarily feel like I’ve been riding a big rig all over the midwest after each game, the graphic design, art, and concept of the game are still pretty attractive to me as a theme. And with some of the variant rules planned for the full game (which I haven’t seen in person yet), and hopefully with the inclusion of truckeeples (aka 18wheeples, if the stretch goal is reached), I think the theme will come through even stronger. 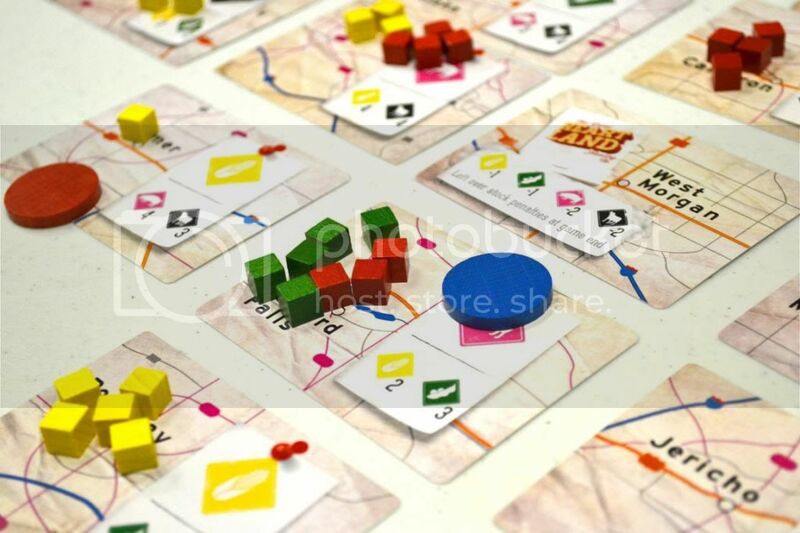 I don’t know of another pickup-and-deliver game that fits into this same category of game length or weight, so The Great Heartland Hauling Co. is pretty unique in the hobby. It’s a filler-length game that still manages to ‘deliver’ both with its depth and how well its pulls off the core mechanic. • Downtime: Turns are quick and you can plan ahead, so even in a 4-player game, there’s not a lot of downtime. • Player Interaction: Some indirect interaction through blocking areas and competing/racing for the same goods. • Length: Incredibly quick but still satisfying. 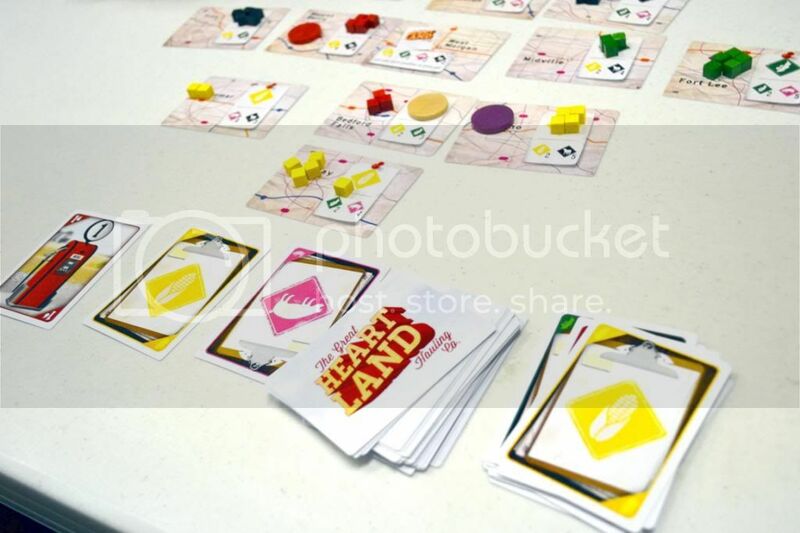 If The Great Heartland Hauling Co. sounds interesting to you, you can find our more about it at Dice Hate Me Games or on its Kickstarter page. Its funding campaign ends on September 6, 2012. 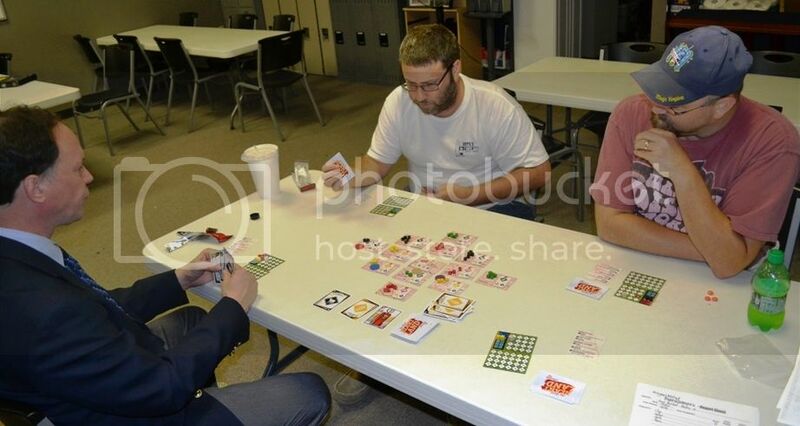 I got to play this once at WBC, and I had exactly the same impressions you did. I wish I’d got to play it more, because I definitely didn’t pick up on the strategy the first time around. This is a fun little game with a lot of possibilities. Previous Post: Just 2 Days Left for the Contest!